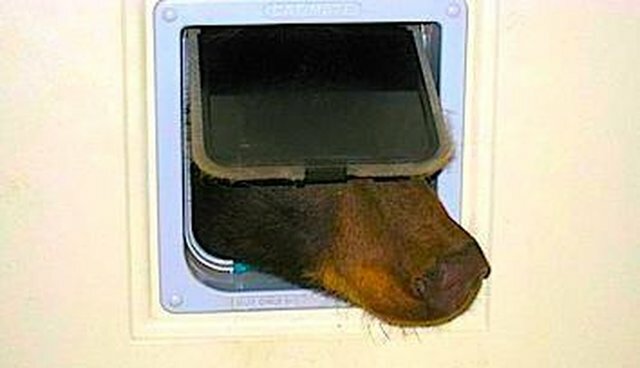 Bear Tries To Squeeze Through Cat Door ... Again. And Again. An Idaho man came home Thursday to find an enormous wild animal trying to squeeze through the little, dinky swinging door meant for his pet cat. So the guy stood there and snapped a few photos while the bear stared at him from the tight spot he'd gotten himself into. The man had good reason to be kind of unfazed. This wasn't the first time wild bears had dropped in on him. A few days before Doug Harder snapped this particular set of photos, the bear had slid open the sliding glass door and helped himself to some snacks in the kitchen. "He likes flour, brownie mix, Toblerone and went all the way to the back bedroom for a can of Pepsi," Harder wrote on Facebook. After Harder secured the sliding glass door, the bear came to the cat door on Thursday, which is when he snapped the photo. "It all started with me sending the local tv stations in Spokane yesterday a photo of a young bear trying to get in my condo through the cat door. I thought it might be shown on the local evening news, nothing else!" Harder wrote, shocked that the incident had gone viral. And even after the photos gained notoriety, the bear came back on Friday trying to get through the cat door AGAIN. Still, Harder doesn't think it's that big of a deal, though news outlets (like The Dodo!) are going crazy over the encounters. "I think it is mountain out of a mole hill story, had NO idea this would all happen," he wrote on Facebook. Learn how to minimize conflicts with bears here.